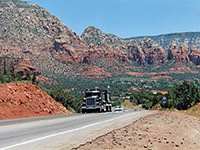 A good way to get a view of Sedona from within a short distance of the center is to walk or drive a mile or two up Schnebly Hill Road, which meets AZ 179 just south of the US 89A junction. The road climbs steadily towards the Munds Mountains past a few houses (and a good RV site), before becoming unpaved and passing through unspoilt cacti-filled countryside - from here the whole town may be clearly seen, in the valley below. Schnebly Hill Road eventually climbs more than 2,000 feet and meets I-17 after 13 miles (exit 320). 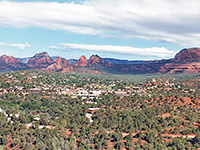 Both road and town are named after Sedona Schnebly, the wife of the first man to settle in this area. 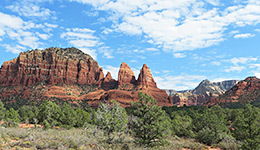 There are three main wilderness areas around Sedona - to the southwest is Red Rock State Park, which is centered around Oak Creek. This has paved nature trails and ranger-led tours and offers an educational, but rather tame, introduction to the region. To the east, the Munds Mountain Wilderness encompasses many square miles of land - principally the mountain itself and two large canyons (Jacks and Woods), although there are not many hiking trails and access is somewhat restricted. The most extensive of the three is to the northwest - the Red Rock Secret Mountain Wilderness and surrounding countryside, which contains the most scenic and spectacular of the cliffs and ravines. 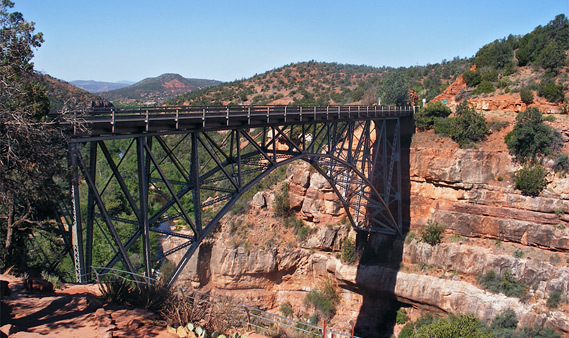 Here are several paved roads giving good access up to the edge of the cliffs and canyons, and many hiking trails; also there are places to camp (free) along side tracks, with uninterrupted views of the red, white and green landscape. The area is reached along forest road 152 (Dry Creek Road), which branches north off US 89A near the west edge of town. One of the most popular hiking destinations is Vultee Arch, a large, graceful sandstone arch near the end of a colorful wooded canyon. 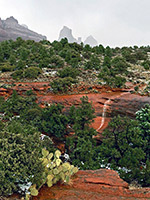 The best-known trail in the Sedona area is along the West Fork of Oak Creek, while another good location for free camping is around House Mountain, a few miles south of town along AZ 179, an area reached by forest road 120. The rocks in the walls of Oak Creek Canyon are the same as some of those seen at the top of the Grand Canyon - mainly Coconino Sandstone - although here they are more covered by vegetation. The best place to appreciate the scale and nature of the canyon is from an overlook off US 89A just before the road descends - from this it is possible to see many miles south. There are usually many native Indians at the overlook selling artifacts, as this is quite a major tourist stopping-point.